In 2009, a group of volunteers stepped into the Woonasquatucket River at Donigian Park wearing waist-high heavy rubber boots and sturdy gloves to protect against the river’s pollution. 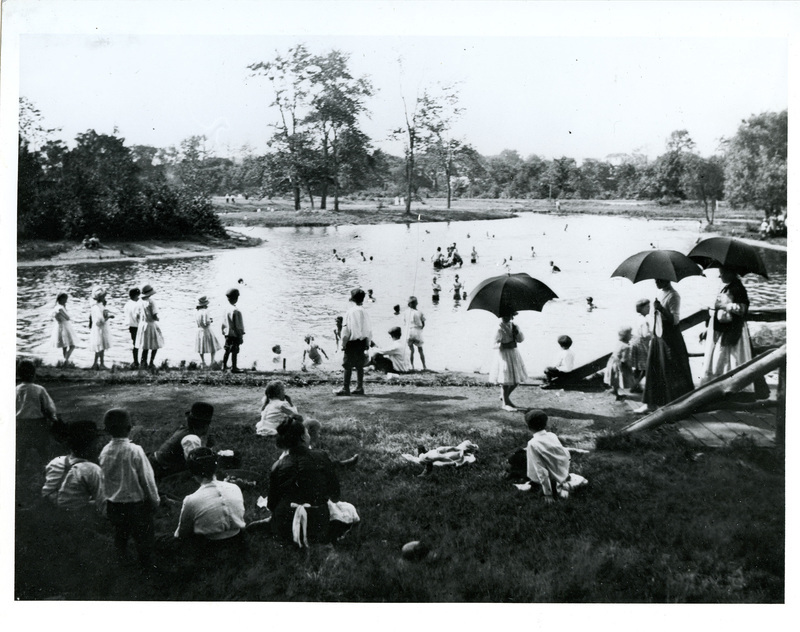 Donigian Park in the Olneyville neighborhood of Providence had once been a major destination for thousands of Providence residents who, in the 1880s, visited both Donigian and Merino Parks to enjoy a swim, a picnic, and the greenery. But by 2009, the park had become a defacto dump. On that single clean-up day, volunteers pulled out 150 shopping carts and two tons of automobile tires from the river. Even in the 1880s the city should have warned residents against swimming in the Woonasquatucket. While mills, factories, and other industries used the Woonasquatucket River as a power source to engine their factories, they also used it to remove garbage and other waste from their buildings. Trace amounts of metals like zinc and cadmium, used to set dyes on fabrics, and pesticides containing mercury and arsenic, used to prevent insect damage to wool and cotton, made their way into the waters. But the biggest source of trace metals came from the production of the machinery used in these water-powered factories. Tin, iron, copper, and pewter used to make tools and parts regularly escaped into the air, soil, and water or were buried as a simplistic means of waste disposal. Most of these facilities used some type of volatile or semi-volatile organic compound to clean machinery and tools such as trichloroethylene and perchloroethylene, known carcinogens. Many of these pollutants can still be found in river sediments today, more than 100 years after they were released. Specific attempts to reduce the emission of at least some metals began in the 1950s and 1960s, but legislative requirements for industrial pretreatment of wastewaters did not come until the 1972 Clean Water Act. As more activist environmental movements took hold in the 1980s, concern for the status of the river and its importance to the city and the surrounding neighborhoods grew. 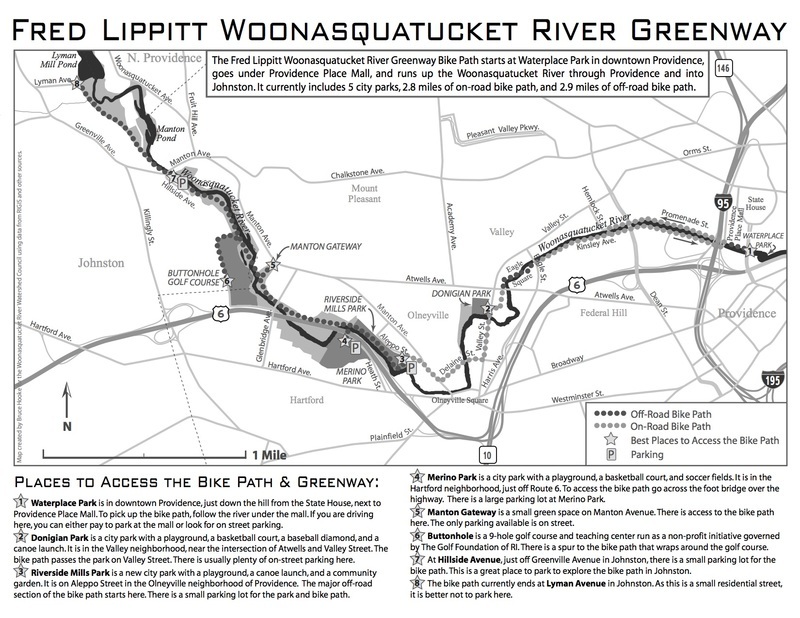 In 1998, the federal government designated the Woonasquatucket River as one of 14 American Heritage Rivers, commemorating its role in the nation’s industrial history. Shortly after, The Woonasquatucket River Watershed Council formed to improve the environmental, recreational, and economic assets of the river and its watershed. Thanks to their efforts, Donigian Park is once again a beautiful urban refuge. A Novel Spectacle: Trace metals in the Woonasquatucket River drew prospectors looking for gold to Providence. 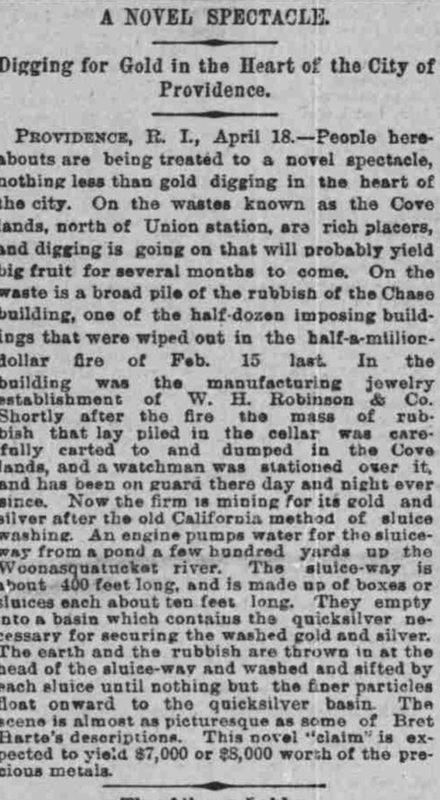 ~ Source: The Indianapolis Journal, April 19, 1888. Library of Congress. 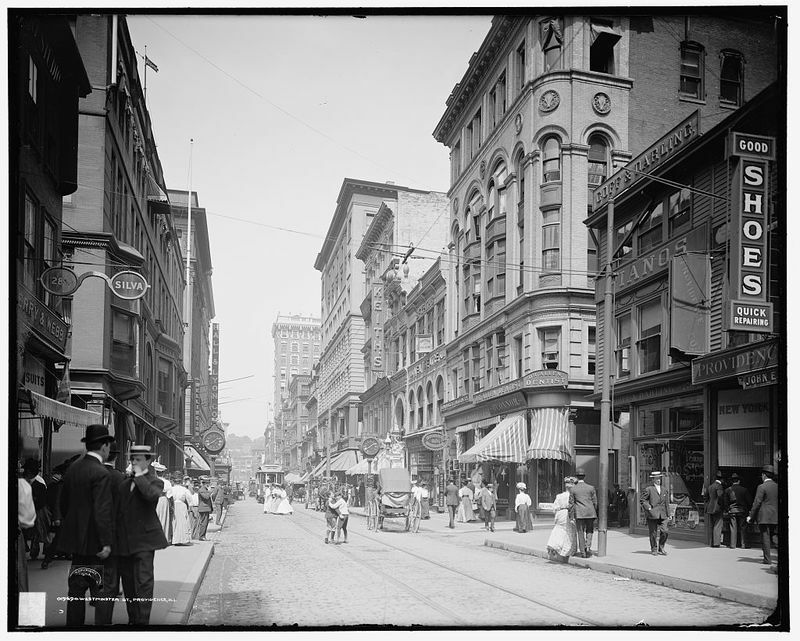 Providence in 1906: As Providence grew, so did the sense of being crowded in the city. The Woonasquatucket’s health continued to decline as Rhode Island’s population and industries expanded. ~ Source: The Rhode Island Collection, Providence Public Library. The 1973 Clean Water Act established the basic structure for regulating pollutant discharges in our waters and gave the Environmental Protection Agency the authority to implement pollution control programs. Read the 1973 Press Release of new water quality standards here. In 1988 the city began the relocation of the Woonasquatucket River to build Waterplace Park, giving concerned people the chance to enjoy a river they had all but written off. 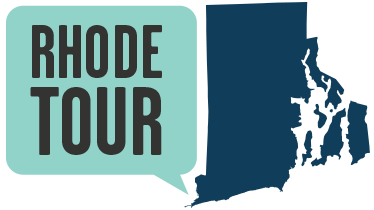 Listen to Jane Sherman, founder of the Woonasquatucket River Watershed Council, as she discusses how she got involved in restoring the river. Read an article published in the Rhode Island Historical Society's Rhode Island History that focuses on the redevelopment efforts of downtown Providence and its rivers. Jane Gerhard , “Donigian Park and a Legacy of Pollution,” Rhode Tour, accessed April 21, 2019, http://rhodetour.org/items/show/215.